Braybrook, a residential and industrial suburb on Ballarat Road (once the Western Highway), is 9 km west of central Melbourne. It has also been the name of a shire which was the forerunner of the City of Sunshine. In 1848, during a period of anti-Irish feeling, three Melbourne residents acquired one square mile of land as a place for English people to reside and named it Braybrook. Its English street names traverse the area which is now in Sunshine North, west of present day Braybrook. In 1901 nearly half of Braybrook shire’s population was recorded as Anglican. The Braybrook Hotel (1854) and the Shamrock Hotel at Albion were early stopping places along the road to Ballarat. 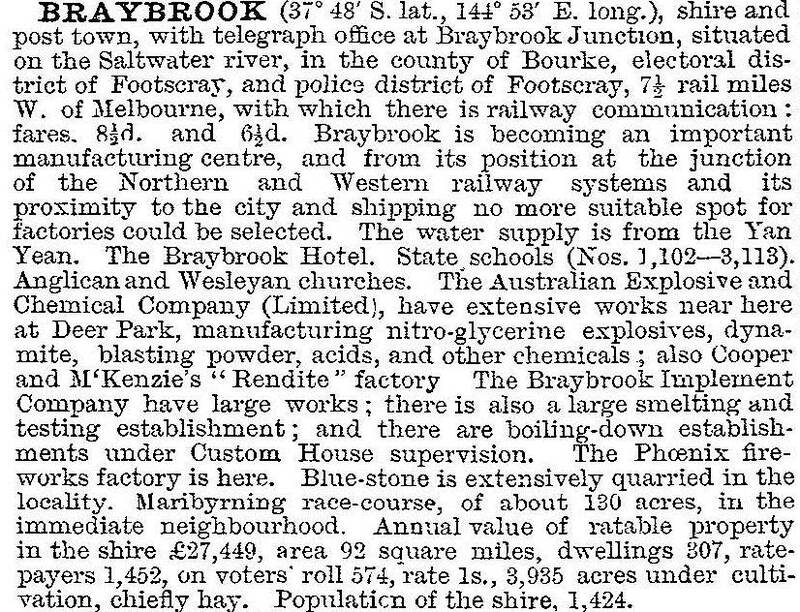 The Braybrook Road District was proclaimed in 28 May 1860 after a public meeting at the Shamrock Hotel. The District extended from Melton to Dynon Road on the West Melbourne swamp. In 1859 the railway line to Sunbury (and ultimately Bendigo), was opened, running south of Braybrook. When the line to Ballarat was opened in 1889 the place where it joined the Bendigo line was named Braybrook Junction, later Sunshine. Braybrook Junction became the shire’s commercial centre, particularly when the McKay harvester works opened there in 1906. The shire’s name remained Braybrook, however, until 1951 when it became Sunshine city. The municipality had been reduced in size by severances to Melton shire. 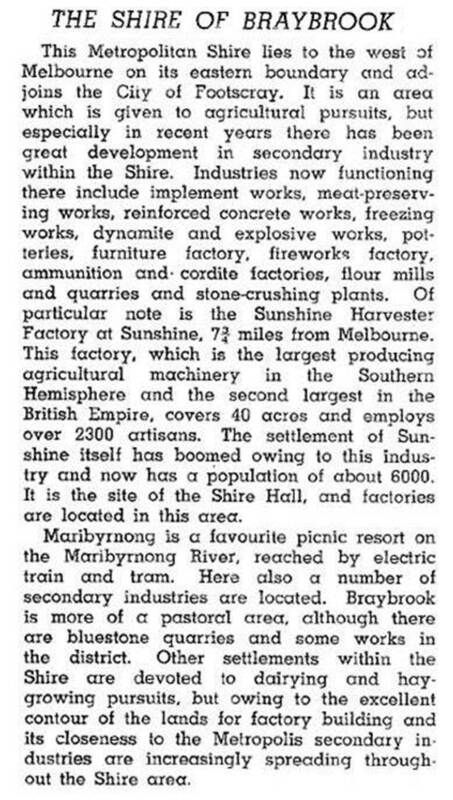 Apart from grazing and the growing of fodder, the chief industries in Braybrook were quarrying and the manufacture of animal commodities such as tallow and fertilizer. There was also local dairying and poultry keeping. Sunshine attracted the majority of industrial development, with small amounts at Albion and Deer Park. The years after World War II, however, saw large migrant hostels in the Sunshine region, and many of the immigrants chose to settle there. Housing estates were built for munitions workers during the war, and after the war houses were built for railways workers. The Housing Commission built over 2500 houses, flats and shops in Braybrook and Maidstone during the 1950s and 1960s, most of them in concrete. In 1952 the Catholic parish of Braybrook was formed from parts of the Footscray and Sunshine parishes, and the Christ the King church and school was opened, initially in an empty migrant workers’ hostel. In 1965 a Catholic Boys’ college opened. The Braybrook State high school opened in 1961 (1177 pupils, 2014). It began in 1960 in the field artillery barracks at the Maribyrnong Ordnance Factory. On the edge of Braybrook is Tottenham, and the former Tottenham Royal Australian Air Force (RAAF) stores (1949) were in Braybrook. So too were the Tottenham technical school (1958-91) and the Tottenham North primary school (1953). The technical school became an English language centre. Between the railway line and the former RAAF stores is a railway reserve, which is one of the few remnant areas of the Western (Basalt) Plains Grassland. In 1992 it contained one endangered plant species and four others of regional significance. The Tottenham railway station is on the border with Footscray West. A little to the west was the Tottenham primary school (1953-93) and the former sites of the White City railway station and dog coursing venue. Elsewhere are large industrial sites, including Olex Cables and Dalgety Wool Handling Centre. Braybrook has a small shopping centre area opposite a public reserve in Churchill Avenue and Braybrook drive-in shopping centre in Ashley Avenue and the Central West drive-in shopping centre (also in Ashley Avenue) on the former RAAF stores land. The Catholic schools are campuses of Caroline Chisholm College. There are three recreation reserves, one with the Sunshine Bowling Club and another (the largest) with a library, youth centre and a community garden. The largest church is Catholic, but there are also an Anglican church, a Vietnamese Cao Dai temple and two Buddhist temples. The decline of manufacturing has resulted in numerous unused factories, although the RAAF land has been redeveloped for houses and a business park. Braybrook’s most notable industrial building is the heritage listed Eta foods factory (1961), designed by Frederick Romberg. It has a striking glass curtain wall with vertical steel columns and metal bracing. The factory included a courtyard garden. It is in Ballarat Road, west of Lacy Street. As the municipality became Sunshine city in 1951, later information and census figures are found under the latter name.